No doubt you’ve seen the photos of military service dogs lying in despair beside a casket or headstone, silently grieving for a fallen handler. Heartbreaking. 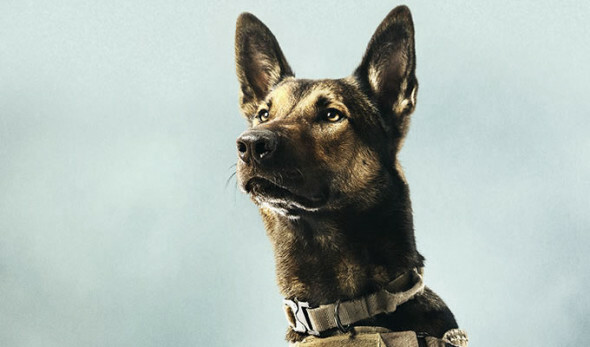 At its core, Max is a film with a worthy goal – salute these dogs and the work they do. But that goal gets lodged between an after school special adventure and some pretty blatant armed forces recruitment. The canine Max is a Belgian Malinois Shepherd and a dedicated Marine, serving in Afghanistan alongside his handler Kyle (Robbie Arnell). Kyle’s family members, including former Marine dad (Thomas Haden Church), loving helpmate mom (Lauren Graham) and disgruntled teen brother Justin (Josh Wiggins), are shocked when Kyle is killed in action, and subsequently agree to adopt Max after he’s deemed too distraught for continued service. Director/co-writer Boaz Yakin (Remember the Titans) provides one dimensional characters full of shallow dialogue, with clearly marked heroes and villains amid swelling music in case you miss any Lifetime channel melodrama. From there, the film suddenly becomes a race for three kids on bikes with a hero dog to bring down a weapons dealer who’s in cahoots with the local sheriff. Wait, arms dealer? Yep, and there might be drugs involved, too! Okay, if you’re aiming no higher than ‘tween sensibilities and ‘just say no,’ I get it, and who can dislike this dog? There’s even one surprisingly tender scene where Justin comforts an anxious Max during a fireworks show, a nicely subtle reminder of the different battles many veterans face once they return home. But that last act…oh my. Any hint of subtly is forgotten via a highly contrived finale intent on marking military service (and more specifically, actual battle) as a required rite of passage for manhood. All that’s missing is the dramatic voiceover. There’s probably a nice family film buried somewhere deep in Max, but once the bullets start flying and the bridges start exploding, you’d need a bloodhound to find it.